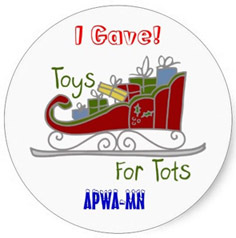 The APWA Minnesota Chapter will have our annual collection of toys and cash for the benefit of the Toys for Tots program during the Fall Conference. It’s a great program and has many rewards associated with it. Your donation will bring a smile to the face of a child. You can see your chapter donating the toys on Kare 11. You will be supporting the U.S. Marine Corps Reserve Toys for Tots Program! New this year are stickers you can proudly wear to show your support. Donate $5 and get a sticker. Donate $20 and get a bigger sticker! Donate $100 and get 5 bigger stickers! No limit! Look for the elves in the Santa’s Helpers hats during the conference to donate and get your sticker(s). As a bonus, whoever has the most stickers will get to wear a very special hat during this year’s bowling extravaganza! Be the jolliest! Of course, if someone donates more during the bowling event, THEY will then be the proud wearer of the hat! Cash or checks only. Please make checks out to APWA-MN. Let’s all be Jolly Old Fell-ers and Fell-ettes and give BIG this year!